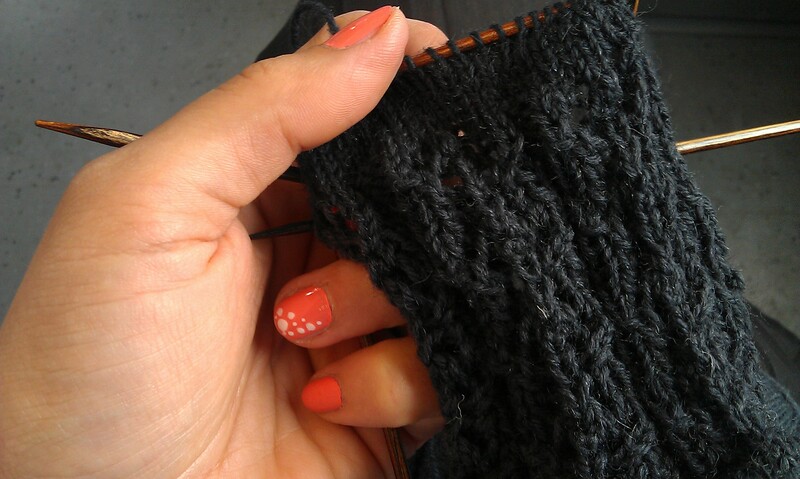 Joining Ginny’s Yarn along for a quick update on what I knit, read and in my case how my nails are painted, as I just posted another post on my trip to Berlin for the Fashion Week (check it out for a designer Give away!). Nothing new much on my WIPs the Popsicle Dress, the Star Stitch Blanket and the Lace Shawl. But as I travelled to Berlin yesterday and needed a small take away project I started Bintje Socks. Mine will be dark blue and not long but rather short as the sock yarn is a one skein only from my stash. My nails are painted in essies’s tart deco (the must have light coral for the summer, it seems) and the ring fingers are dotted with small white dots. As for reading I think I will skip “Die Ketzerin”. The book is rubish, honestly. Drawn together historical nonsense spicked with unrealistic love scenes and no obvious story after 200 pages! I downloaded my first ebooks and am now reading a classic: Pride and Prejudice. I watched the movie, loved the Indian version of it “Bride and Prejudice”, a very very fun movie, but have never read the book so I’m reading it now. What have you been reading and knitting this week? This entry was posted in Knitting & Crocheting and tagged essie, Knitting, Lace, Socks, Yarn Along by kathatravelling. Bookmark the permalink.